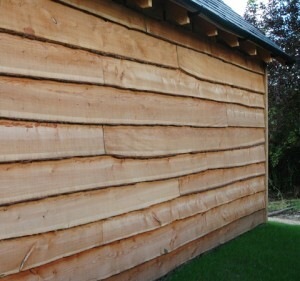 Waney-edge cladding is a very traditional style of cladding created by overlapping boards sliced straight from the tree. Each board has one waney edge (with bark on) and one square edge. Examples of waney edge cladding can be seen on buildings dating back many hundreds of years, often painted in traditional black bitumen paint. 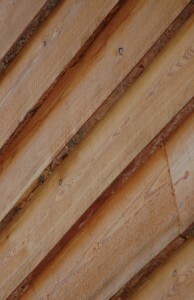 Today the most common species used for waney-edge cladding are British larch and elm. Oak is occasionally used but the tendency of the sap wood to rot can cause problems. This style of cladding is ideal for projects such as barn conversions and listed buildings. The boards are laid to show the waney edge, with an overlap of 40 – 50mm. It is important to follow fixing advice, particularly when using green (wet) timber. Waney-edge boards are supplied in various widths. It is advisable to select boards in batches of approximately equal widths before starting. This will help achieve runs of a consistent depth across the building.Begin at the bottom, ensuring that the first board is level and the waney edge is facing down. Use a 19/25mm strip (depending on the thickness of the board) behind the lower edge of the bottom board for support. Overlap subsequent boards by 50 – 65mm. It is important not to reduce the recommended overlap. Waney-edge boards are cut from green* (wet) timber and will, as a result, shrink by up to 15mm as the board dries. End joining of the boards should coincide with a batten and should be staggered to ensure that subsequent boards do not joint in the same place. *It is important to consider the potential dimensional shrinkage and movement of green timber. Depending on the species, boards may shrink by 10% over the first two to three years as the wood dries. If exposed to hot, dry weather before or soon after fitting, boards are likely to cup, warp and split. 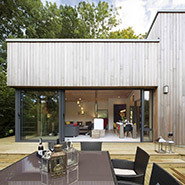 The best time to fit cladding is in the autumn or winter.